It’s the item most people grab when they’re heading out the door because it contains money, credit cards, drivers license, identification and… a knife. While many people don’t keep a knife tucked away in their wallet, those who do claim it’s a great way to never forget your knife when you quickly step out the door. Knives are made specifically for a lot of activities, whether it’s fishing, hunting, parachuting, opening boxes and more. However, sometimes you just need a small knife to open an envelope or slice a stray string. That’s why some manufacturers make knives small enough to fit into your wallet. If you’re interested in picking up a small knife for your wallet, here are some of the best choices. This unique knife with a clever design is probably the perfect knife for a wallet. It folds up into the size of a credit card, so it can easily slip into the pockets of a wallet. It’s only 2.2mm thick, but it features a blade with a 65mm cutting edge. The SOG Access Card is an amazingly compact knife that’s thin enough to fit inside your wallet without being too bulky. The blade is 2.125 inches long. It also features some additional tools hidden in the handle. If you’re looking for a straight-up thin folding knife that can fit into your wallet, nothing beats the Secretary by Victorinox. This traditional knife is really thin at about 3/16 inches. If you still want something with the Victorinox name but made specifically for your wallet, the SwissCard is your best bet. 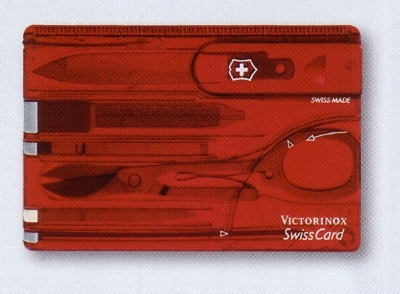 The SwissCard is more of a kit than a knife because it features nine stainless steel tools, including a small letter opening knife. This knife is essentially the same thing as the SwissCard, but it comes with a tougher knife with a serrated blade. Tool Logic also creates a variety of other cards, including the hunter card and business card. Getting away from the card theme, this KA-BAR is about the size of a credit card, but it’s definitely not shaped like one. This is considered a last resort knife that fits nicely into your wallet. It comes with a sheath and a cord.